‘One of the best places to visit in the world’ – National Geographic Magazine. This is your opportunity to discover a hidden gem; a land steeped in history with its own natural beauty. An area that remains undiscovered except by those willing to go that extra step to find a landscape scattered with architectural treasures – the UNESCO classified town of Evora, the castle of Valango and the magnificent walled village of Monsaraz all within an environment that remains unspoilt and full of tradition. You will stay in 3 different but beautifully appointed accommodations – a restored Quinta, a modernised convent and a typical Alentejo town house in the heart of Monsaraz. All rated 4 stars. Day 1. Arrival at Evora where you will be met and transferred to the Quinta (Evora is 1.5 hours by bus from Lisbon and there is a good daily service). Dinner with a welcome drink in the evening. Day 2. A walk through the countryside awash with herbs following the magnificent 16th century aquaduct to the town of Evora where with our guide notes you visit the magnificent monuments, the old Roman temple and the surreal chapel of bones, depending on route chosen 12 – 15km. Transfer back to the Quinta. Day 3. Enjoy the beautiful holm oaks forests scattered with large granite boulders that were used by our ancestors 6,000BC to build there burial chambers and cult sites. 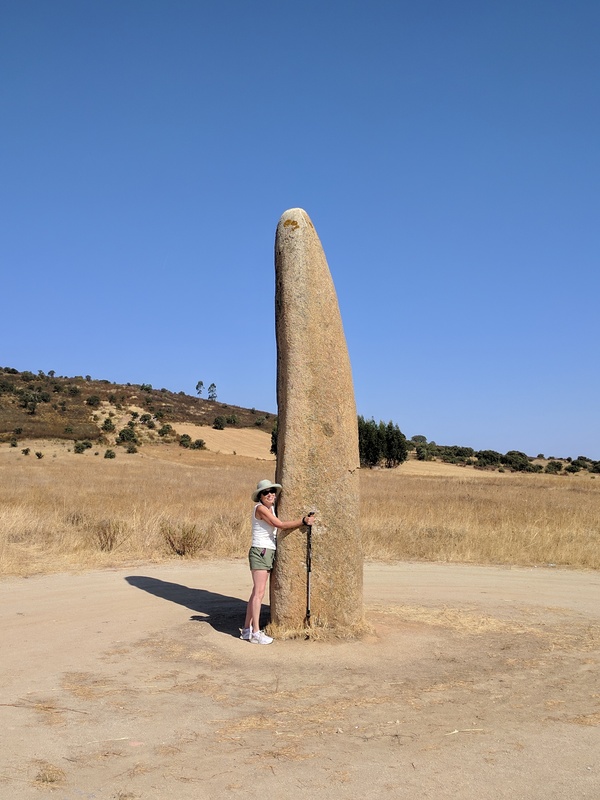 On the walk you will visit the Dolmen of Zambujeiro – biggest in Europe, the Cromelech of Almendres, the Menir of Almendres and the church of Mitra, depending on route chosen 15 – 18km, overnight the Quinta. Day 4. Today it is an amazing walk. From the Quinta you follow the Degebe river valley to the castle of Valongo perched on a hilltop in the middle of nowhere! From there you continue you on the old town of Redondo, 12km. Overnight Redondo. Day 7 A wonderful walk down through olive groves and ancient countryside before climbing gently back up to Monsaraz with time to explore the town and enjoy the views of the lakes from the town walls before walking on to your hotel, 11km. Overnight Monsaraz.